By John C. Toman. Posted July 11, 2011, 8:46 PM. 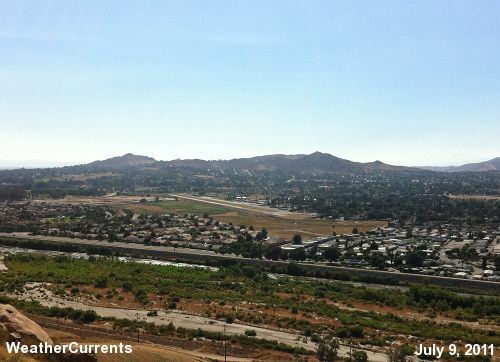 With the official launch of the Jurupa Valley weather station, the Inland Empire and WeatherCurrents gain another community weather site and local resource. WeatherCurrents' network of sixteen stations now includes truly local, by-the-minute weather from the newly incorporated city, located just north of Riverside in Riverside County. The city was formed on July 1st from the neighborhoods of neighborhoods of Mira Loma, Glen Avon, Sky Country, Indian Hills, Pedley, Rubidoux, Belltown, Jurupa, Jurupa Hills, and Sunnyslope. The estimated population is 95,000. WeatherCurrents' local station in the City of Jurupa Valley is between the Jurupa and Rubidoux neighborhoods, about a mile north of the Santa Ana River, a mile west of the Flabob Airport, and a mile south of Limonite Avenue. It complements WeatherCurrents' existing Riverside location in the Canyon Crest area. The two locations are about five miles apart. Weather data began streaming online from Jurupa Valley Saturday afternoon. The Jurupa Valley location is WeatherCurrent's fourth new station of the year, joining locations in Beaumont, San Bernardino, and Simi Valley. We plan on continuing to expand for the rest of this year. New WeatherCurrents locations are forthcoming in Aguanga, Carlsbad, Corona, Thousand Oaks and the Verdemont neighborhood of San Bernardino.